practice – The Humanities Now! 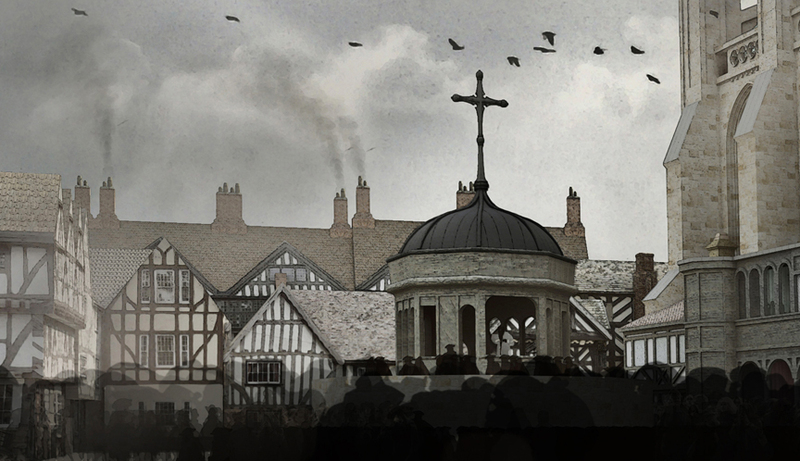 The Kindred Britain project is a digital humanities project that shows how historical figures, mainly from Britain, are related through mutual connections. Home page of the Kindred Britain website. Each blue or purple dot represents a person. Display after making a connection between two people. This is a very distant relationship, as there are 22 people connecting Newton and Shakespeare. In the top half of the screen the user can see how exactly the two people are connected. The lines connecting each person in the relationship are color-coded to show if they are married or blood related. 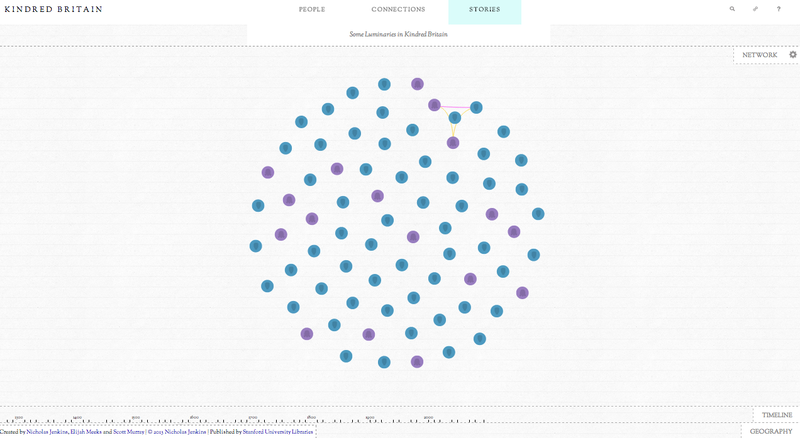 In the bottom half of the screen the user can see the life-spans of each person and when they crossed paths with each other. It is very clear how extremely important the visualization aspect is to this project. The project displays the connection rather than stating, “Isaac Newton was William Shakespeare’s granddaughter’s father-in-law’s brother-in-law’s sister’s grandson’s wife’s sister’s grandson’s wife’s great-great-grandfather’s brother’s great-great-grandson.” Statements like these might give the user a headache and they will not want to use the program anymore. The visualization technique is what makes the project so sleek and easy to use. The networking method is the base of the project. The project probably consists of a program containing an algorithm that starts from each person and iterates through their relatives until a common relative is found. The network method fits with the scholarly subject matter because the project is relating two people to each other through their common connections. This creates a whole network of people, which is where the visualization method takes over neatly displays the web of relationships. The Kindred Britain website by Stanford University helps to show the known family trees and connections of and between historical figures. The website also provides information about the degrees of separation between different figures. The use of digital humanities brings the information to life and engages the user. Kindred Britain succeeds in making the website interactive and easy to use. 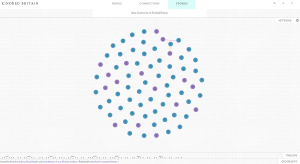 The primary digital humanities approach used in the creation of this website is visualization. The information and family connections are graphically displayed in a series of bubbles, as shown below. The simple background andcolor scheme balances well with the large amount of information. Other key focuses of the website include networking and archives. Many of the people and information provided are from centuries ago; therefore this is an archival source. The digital humanities component of this site modernizes the archival material. Visualizing the data into networks that the user can click for more information was quite appropriate for the subject matter. Here is an example of a typical family tree. This one shows Charles Darwin’s connections. The creators of the site were able to provide quite a bit of information about his lineage. An interesting fact Kindred Britain provides is that he is only fi ve degrees of separation from Virginia Woolf. This is just one example of the many networks and archival information that the site provides. Kindred Britain combines valuable historical data with style to further emphasize the information being presented. The digital humanities program “Virtual Paul’s Cross Project” intends to recreate a scene to allow us to experience a Paul’s Cross sermon that happens on Tuesday, November 5th, 1622. 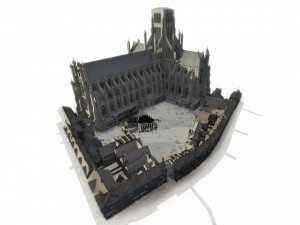 In order to present it, the researchers provide not only the physical environment model of the church but also the acoustic model of the churchyard through audio analysis and visualization. The researchers analyze different aspect of the church site, such as the churchyard, the preacher and his preaching style, the weather, the size of crowd and even the acoustics. The history evidences are collected from paintings and maps, which depict the detail for the social environment, such as the size and the structure of the church and the clues for the movements of Donne. The books, such as The Book of Common Prayer, also provide strong evidence to the order of service. To make the tremendous data easier to understand, the researchers summarize and present them not only with words, but also with visual model, which is a more direct description to the site that can only be found in the history. 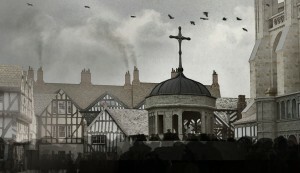 For example, when the researchers describe the weather of the church, they first provide a bunch of data analyzing the weather of London in 1622. Then, to help readers directly “see” the church, the researchers provide a visual model of the church. The picture shows a more precise description for the church: the gloomy atmosphere, the smoke and the bleakness of the place, each with explanations found in the data part. The acoustic model plays the same role with the visual model does. Finding any acoustic sources from the contemporary paintings, the researchers collect these elements together and present them into acoustic model, which helps readers not only “see” the historical site, but also “hear” it. Visualization and audio analysis make the project more acceptable to readers, helping people who are not familiar with such project put themselves into the historical site and experience it with their eyes and ears, instead of simply read it. 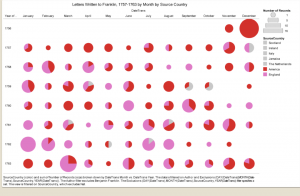 The purpose of the Digital Humanities project “ Mapping The Republic of Letters” is to help people understand the networks of correspondence, the social and physical networks of famous scholars who live before the industrial revolution through the development of sophisticated, interactive visualization tools. I will examine the case of Benjamin Franklin in this post. 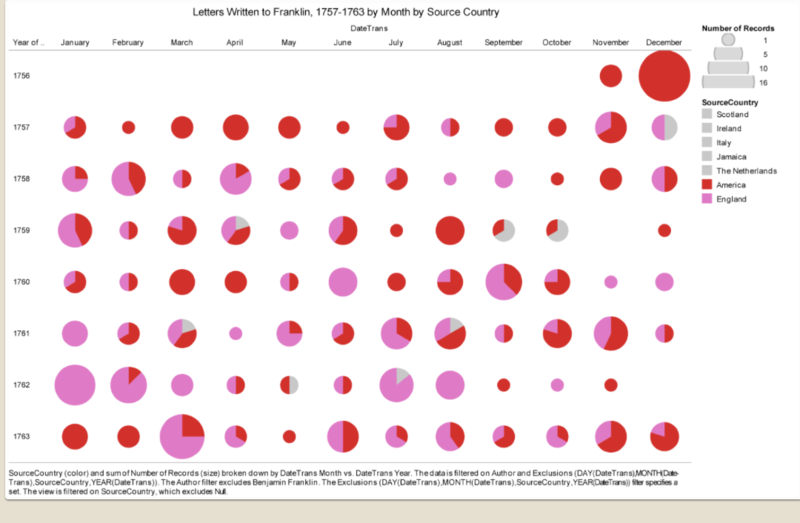 The primarily use of visualizations in Franklin’s case enabled people to understand the nature of Franklin’s correspondence and correspondents network that was comprised between 1756-1763. The examination of visualization also provides people important information about Franklin. By reading the “letters” spreadsheet on this web page, people can find out the month and particular locations of letters that Franklin received. The spreadsheet on the right shows the countries that Franklin received most of his letters from between 1757 and 1763. Franklin received nearly all his letters from two places: British America and England. This leads people to think about the timing of Franklin’s ascent into the ranks of the “cosmopolitan” on the world stage. In July 1757, Franklin arrived in London to represent Pennsylvania in its dealings with Britain. And the year of 1757 is the starting point for a groundbreaking investigation of Franklin in the world of ideas. Therefore, the information provided by the spreadsheet makes sense that Franklin received letters most from British America and England. On the other hand, the spreadsheet shows the process that Franklin was on his way to becoming a giant. Similarly, by reading the “correspondents” spreadsheet, people can learn Franklin’s top correspondents in details such as their gender, county of birth and community association or professional group. People can even find out where do women rank in Franklin’s network—he wrote most of his letters to men. Besides examining visualization can provide important information, the research team developed the approach to further defining terms “Cosmopolitanism”. 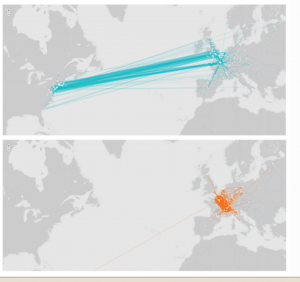 It compares Franklin’s correspondence network with Voltaire’s to reveal the prospects and limits of “Cosmopolitanism”. The geom ap on the left shows Franklin’s network (top) and Voltaire’s (bottom).